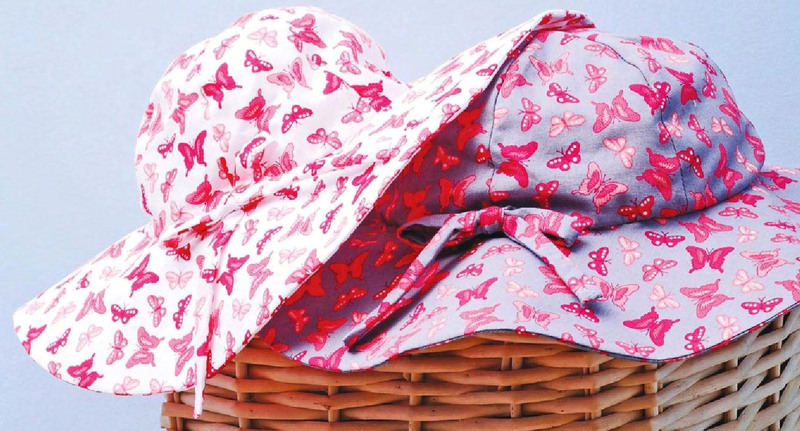 Summer womens Hat Tutorial ~ DIY Tutorial Ideas! - Use 1cm seam allowance throughout unless otherwise stated. - Fabric widths 140cm; interfacing width 112cm. - Chin strap measurement (before elastic insertion) - small 28cm -medium 29cm - large 30cm approx. Please adjust to fit. - Ribbon can be used instead of using fabric for the bow on the hat and the chin strap if you wish. 1. Transfer all pattern markings to fabric and interfacing. 2. Take the main fabric and with right sides together, pin and sew the crown panels together working with three panels at a time, working from the bottom of the panel to the top. Repeat for the other three panels, trimming off all loose threads as you go. Press seams to one side. 3. Pin and sew the two halves together in one continuous machine line. Press this seam open to give a flat comfortable seam, using a tailors ham if you have one - if not a rolled up towel will work. Repeat step 2 and 3 for the lining, remembering to leave one of the lining seams open between markings to pull the hat through to the right side later on. 4. Lay the brim interfacing to the wrong side of the brim. Before fusing together, cut away 1cm of the interfacing only from the inner circle. This will give some ease when attaching to the crown of the hat. Press interfacing in place being careful not to use too hot an iron. 5. Pin main fabric crown to the interfaced brim with right sides facing. With the inside of hat facing, match the six panel seams to the inside of the brim markings and pin, using further pins to fit smoothly. Baste then machine stitch, checking the underneath is lying flat as you sew together. 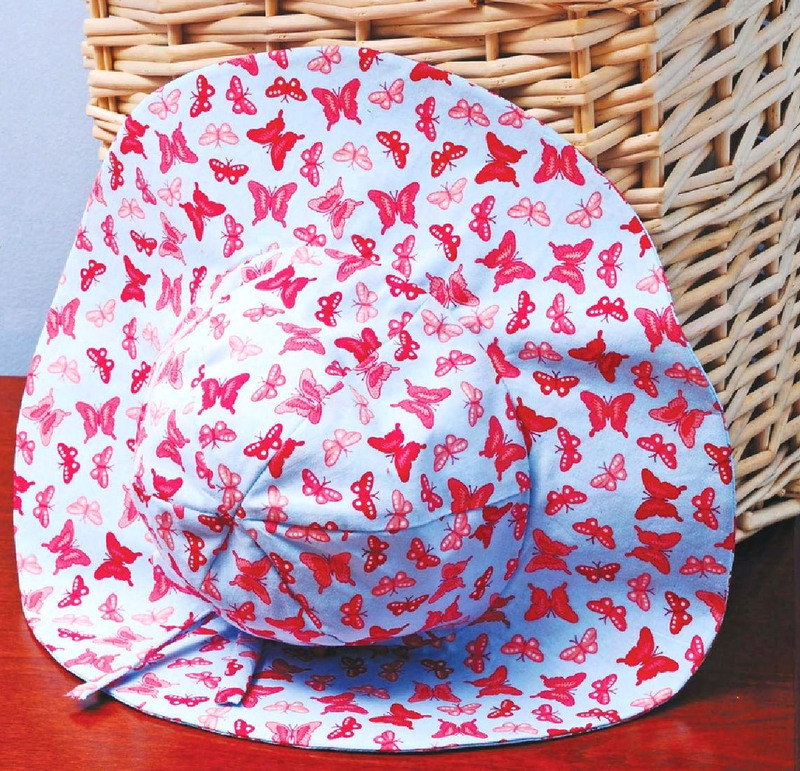 Repeat for the underside brim and lining - interfacing is not required for this brim. 6. Place main fabric hat on table right side facing you and place the lined hat, wrong side facing, on top of the main fabric hat, right sides facing each other. Matching brim marking edges and pin together. It helps to keep the brims flat on the table while you pin, then baste and sew in place. 7. Before turning through to the right side, trim 0.5cm from the machined outer edge of the brim, being careful not to cut the machine stitches. Press brim to lie flat. 8. Turn the hat through to the right side, through the opening in the seam lining, slowly pulling the completed hat to the right side. 9. Smooth the hat brim edge into shape with the fingers, pinning the brim flat to form a smooth edge and press. Hand sew opening on lining with small stitches and also sew a few stitches inside the top of the crown from the inside to secure together, being careful not to show these stitches through to the right side. 10. This is optional, if you wish to add a chin strap. To make a chin strap with right side of fabric together pin and sew 0,5cm seam in a continuous line. Pull through to the right side using a rouleau loop turner, if you don't have one you can use a safety pin by attaching the pin to one of the open ends, picking up a single piece of fabric and passing back through carefully. Press flat. 11. Pass through the elastic using a safety pin and baste the elastic to the one end through the fabric to secure. From inside the hat unpick a few stitches from either side to insert the chin strap. Check that a panel is central at the front of the hat and insert the basted end 1 cm into the seam, pin and tack. Machine stitch the strap from the right side, sewing in the ditch. 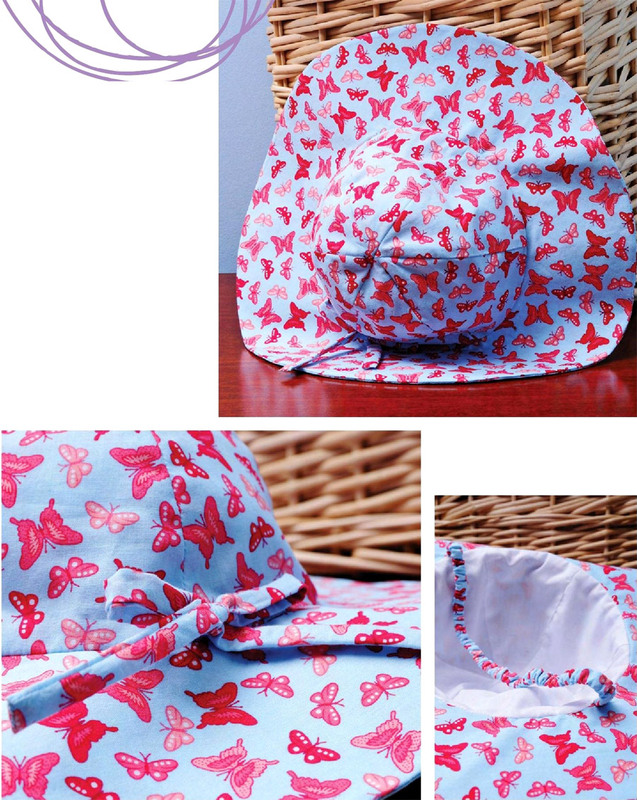 Where the hat and brim seam join, sew 1 cm back and forth a couple of times to secure, checking all is flat underneath. Gathering up the fabric to give a ruffled effect, cut the elastic only to fit then secure end firmly, then repeat as before on the other side. 12. To make bow with right sides together pin and sew 0.5cm seam, pull through to the right side and press. Neaten both ends by tucking in 0.5cm, using the closed end of a small pair of scissors works well, then hand sew to neaten, press. Fold the strip in half to find the middle, then pin to the side seam of the hat where you would like the bow to be, baste and sew 1cm straight line a couple of times to secure in place, being carefully not the catch the chin strap underneath. Tie the bow.